Critics labeled the girls "clueless" and "misguided"
Two elementary school girls are being criticized after kneeling during the national anthem at a Major League baseball game Sunday. 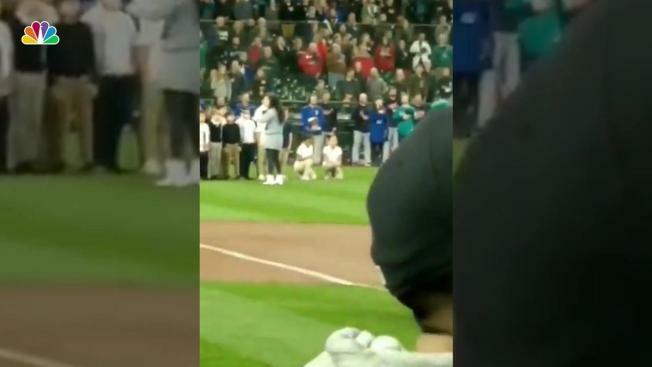 The girls were captured on video by baseball fan Louis Penna as the girls knelt on Safeco Field while appearing with the student choir from Seattle's Mount View Elementary School at a Seattle Mariners game. Kneeling during pre-game national anthems has become a controversial form of protest since San Francisco 49ers quarterback Colin Kaepernick ignited a national movement by refusing to stand during the anthem before NFL games. Kaepernick's action was to protest racial inequality and police brutality. The childrens' apparent protest was posted to Twitter, along with a photo taken by sports writer Ryan S. Clark from the Tacoma News Tribune, where it received mixed reactions. While some praised the girls for "exercising their rights," many more criticized the children for being "disrespectful" or "misguided." In response to the story, a spokesperson for Seattle's Highline Public Schools said the apparent protest was an "individual act by the students." “Obviously, the school district respects the First Amendment rights of our students,” Catherine Carbone Rogers told HuffPost. On Tuesday, the story also appeared on television show "Fox and Friends First," where a host asked U.S. Army officer Jeremy Hunt how young was too young for the girls to know the meaning of their actions. "Children are being taught a political agenda before they can even learn basic American History," he said. "It's so incredible just seeing how the story really shows just the cultural divide taking place in our country," he said. The girls actions also got the attention of Kaepernick himself, who re-tweeted their protest. We take a look back at footage from the life and death of Martin Luther King Jr., 50 years after the civil rights leader was assassinated in Memphis, Tennessee. In 2017, Kaepernick was named GQ's "2017 Citizen of the Year." The men's magazine wrote that Kaepernick's kneeling in protest of racial inequality and police brutality "changed everything." Kaepernick may be out of the league, but his protest has not been forgotten. A number of players have continued to kneel, raise fists, sit or outright stay off the field during national anthems.